Hi all, HRU guys.. Again ,no wonder, I's away from this space cos of some of my personal commitments and our next travel to a new country. Yes, we r in Kuala Lumpur now. Am so excited to explore this new city and to to tell the truth it's almost like New york . We already started loving this place and yet to look around . We've just been to KLCC (City centre) and china town. Gosh, that 's a great mall to hang out and almost all the chain of restaurant which we saw in US is present here and asusual we enjoyed trying them all. I personally, din't like china town that much when compared to other areas..
With respect to food, we are not comfortable eating malaysian food and am craving for some nice hot homemade lemon rasam and paruppu thogaiyal. We found a place close to Little India and yet to get the keys for our house,hopefully by this weekend . There are many places in this city to get explored but they all can wait until we get settled. Yes, U'll never get bored from this part of country as there are lots of places to hang around on holidays. 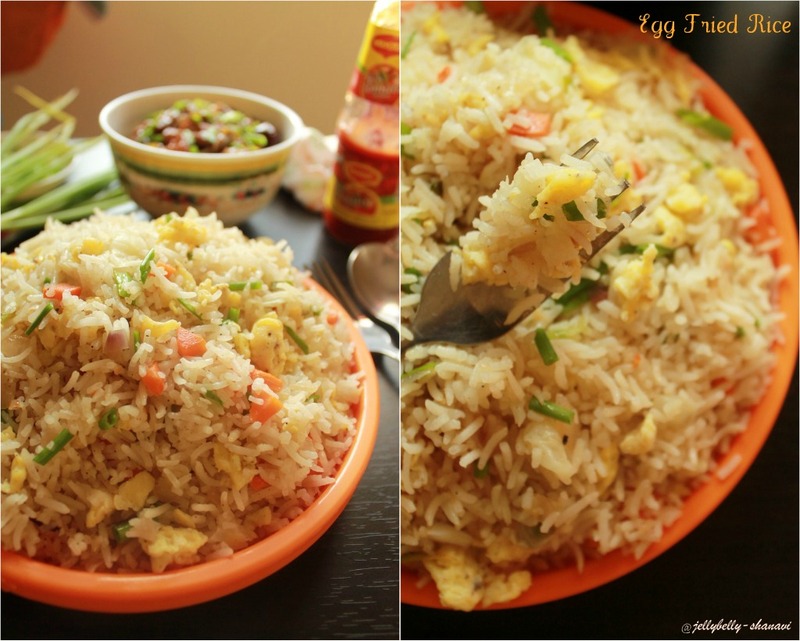 Coming to today's post it's just a simple egg fried rice which I had made when we were in chennai. Hope you all njoy ..
First dice all the vegetables finely and make it ready. Whisk the eggs with salt n pepper in a bowl and keep it ready. Add soya sauce, oil, green chilli sauce, salt , pepper, sugar, vinegar ,water and mix everything in a small bowl and keep it ready. Heat a wok in a heavy flame with a tsp of oil and cook/ scramble the eggs.Transfer the eggs to bowl once it's done. In the same pan pour a tsp of oil & add the minced garlic n spring onions followed by the chopped vegetables. Cook for 2 to 3 minutes until it's crunchy over med-high flame. 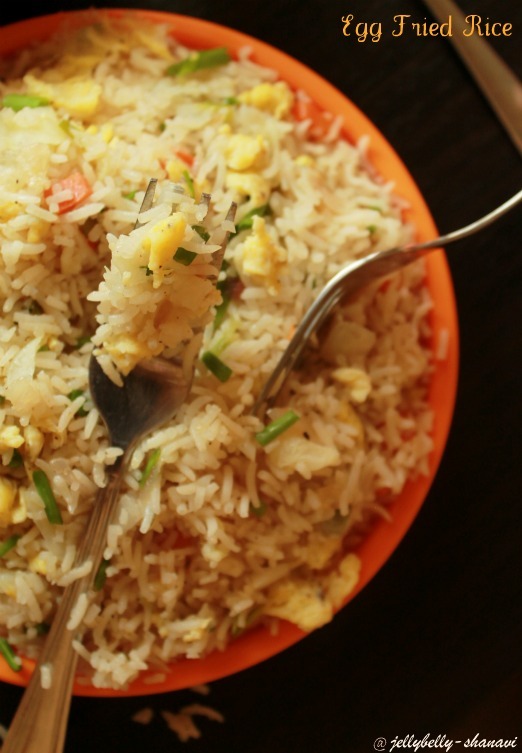 love this rice dish any time any where. you made it so so so well. Thats a fabulous and inviting super tempting fried rice dear, glad for u..KL is one of my fav country after SG, i had a chance to visit it three years back,just love it. Woww.. Awesome presentation dear.. gr8 job !! This really makes me hungry.. Welcome back di.U r my energy booster.Come lets meet thru blogging.I want ur complete phone number with the code.Colourfull egg fried rice. Nice to have you bk in blogging..
Hi dear,how r u..yummy and perfectly made rice..looks awesome. Wow !! Quite nice pic.. Its been a long time since I had Egg Fried Rice.. I think I will try out tomorrow itself..
Lovely Pics Shanavi!! Looks very tempting!! 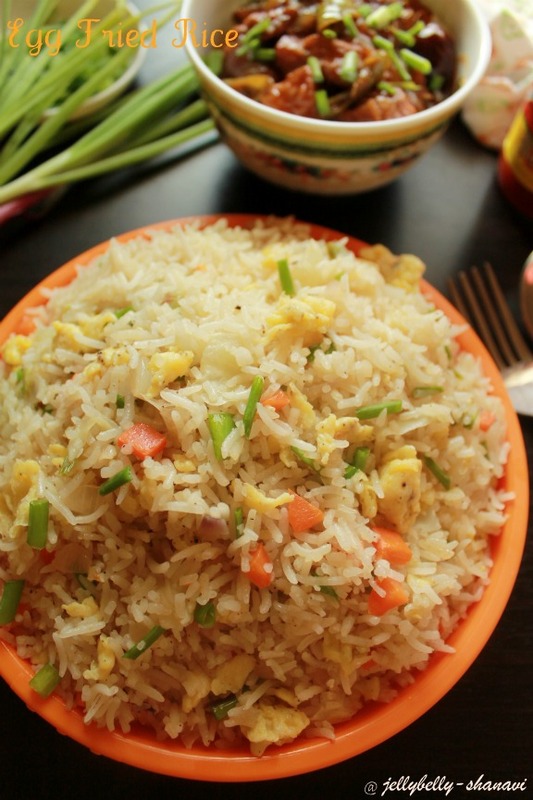 mouthwatering n delicious fried rice..
wow...the fried rice is super tempting...delicious dear !!!! looks wonderful!will try this soon!i love it. Thankyou Miss, You explained it so well with the time duration that a not so good cook like me could do it easily. 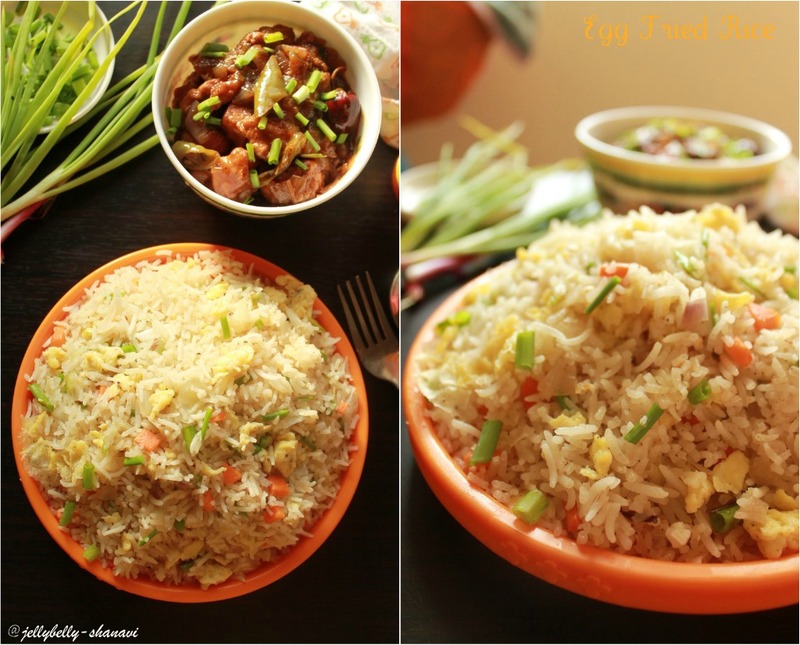 nice fried rice recipe next time i want to try chicken fried rice recipe thanks for this post.